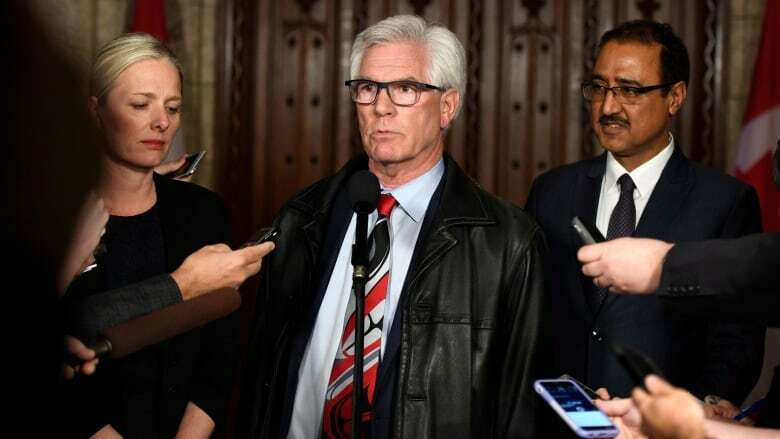 The Liberal government’s emergency cabinet meeting to discuss the political standoff over the Trans Mountain pipeline ended this afternoon with cabinet ministers offering no clues on how they plan to resolve the crisis. The Liberal government's emergency cabinet meeting to discuss the political standoff over the Trans Mountain pipeline ended this afternoon with cabinet ministers offering no clues on how they plan to resolve the crisis. Cabinet was called to Ottawa during a break week to discuss approaches to resolving the impasse between the NDP government of B.C. Premier John Horgan – which is opposed to Kinder Morgan's proposed pipeline expansion – and the Alberta government of Premier Rachel Notley, which is a staunch proponent of a project the federal government has already approved. "The government is 100 per cent behind this pipeline," said Natural Resources Minister Jim Carr after the meeting. "It's important for Canada. It was made in the national interest. We believe that this is important for all regions of the country. We stand behind our decision." Pressed to say whether he would back the idea — floated by Premier Notley — of Alberta buying the pipeline outright, Carr refused to reveal his position. "We've been saying, for the last two days, we are prepared to look at many options," said Carr. "That has not changed. We believe that there are many options that will be of interest for the government of Canada. We'll examine them all thoroughly." Earlier Monday, Notley said her province would buy the Trans Mountain pipeline if that's what it would take to ensure it gets built. "We are considering a number of financial options to ensure that the Trans Mountain expansion is built, up to and including purchasing the pipeline outright if were to come to that, but it is not the only model we're considering," Notley said in the statement Tuesday. Kinder Morgan has given the federal government until May 31 to offer the company concrete assurances the line will get built, and Notley is calling on Prime Minister Justin Trudeau to take action. What that action will look like remains completely unclear, with cabinet ministers refusing to rule any potential solution in or out of contention. Asked whether he would consider withholding federal transfer payments to B.C. if the province continues to oppose the pipeline, Finance Minister Bill Morneau refused to reveal his hand, except to say that he does not make "public threats." "We are, of course, in discussions with B.C. and Alberta. We are in discussions with the proponent and we're not going to negotiate in public," Morneau told reporters in Ottawa Tuesday. The Trans Mountain pipeline expansion project would increase the volume of oil products flowing from Edmonton to the B.C. coast at Burnaby from 300,000 barrels a day to 890,000 barrels. That increased flow from the oilsands is stoking fears that a spill in B.C. 's coastal waters, or a pipeline breach on land, would cause catastrophic environmental damage. Those most concerned have been staging protests in an attempt to disrupt the work that is going on. Kinder Morgan has a court injunction requiring those protesters to stay at least five metres away from its Burnaby marine terminal work sites. More than 160 people have been arrested since then, including Green Party Leader Elizabeth May and NDP MP Kennedy Stewart. Meanwhile, there appears to be little indication that the B.C. government will abandon its current course of action and throw its weight behind the federally approved project. Speaking on CBC News Network's Power & Politics Tuesday, B.C. Green Party leader Andrew Weaver, whose party holds the balance of power in that province's legislature, remained steadfast in his opposition to Trans Mountain. "This risk that B.C. is being asked to bear is simply not acceptable," Weaver told host Vassy Kapelos. "Particularly in a city [like] Vancouver, trying to brand itself as the cleanest, greenest city in the world at the same time as the government is trying to railroad a project through that would brand it as one of the largest exporters of heavy oil in the world.